What is Living in that Rat’s Nest? Success! I am happy to report that Ike’s tail was tangle-free today. Of course since I could now turn my attention to other parts of Ike’s body, I noticed that his whiskers have gone way beyond five-o’clock shadow and are approaching unkempt status. Bad, bad horsey mom. Should I feel shame? [I don’t] We aren’t going anywhere any time soon, so is it really a crime to let Ike go au naturale? Dare I tell you that his mane is also getting rather long and desperately needs thinning? 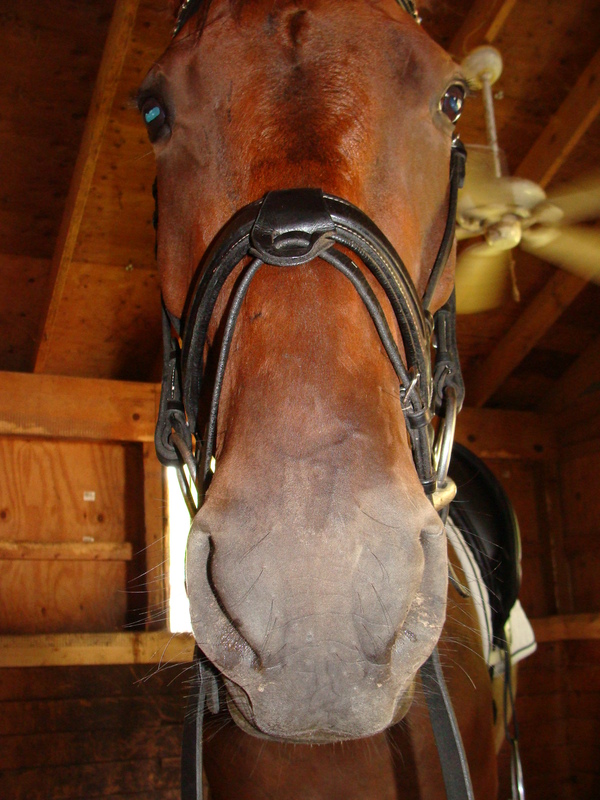 Once the thought of mane and whisker maintenance passed and bare minimum grooming was completed, I tacked up for a ride. As soon as we emerged from the barn, the buzzing terrorists mounted their attack. What fresh hell is this? I’m betting that the only pesticide that was effective against these evil creatures is now banned by the EPA for the toxic effects on an endangered species. We made a mad dash for the mounting block and trotted off hoping to outrun the horse flies long enough to break a sweat. Ike was a bit braced to start – he usually is after a few days off. So this meant many walk-halt and walk-trot transitions, some half halts to get is attention, and when they failed, I resorted to knuckling down while squeezing and releasing repeatedly until I felt Ike soften in my hands. Not something I’d do in the show ring, but decided that it was what I needed to do in that moment. Moved on to our trot work and tried the Training Level Test 3 shallow loop. We need to work on the bend to start and end the loop. It is a bit abrupt at this point and I can see a judge hitting us hard for the lack of flow. Also continued to school leg yield. I have to be very careful that I don’t get too aggressive at this point in Ike’s work; he is narrow behind and can interfere when he gets off balance. I am trying my best to give the correct aids and keep the correct bend so that he doesn’t lose confidence in his lateral work. After 30 minutes, the flies starting landing on Ike and the sweat in my eyes started burning, so we opted to be weenies and be done. Got Ike hosed down and left him munching hay in the comfort of his stall. Got a good look at my hair in the rear view mirror as I got in the car…talk about a rat’s nest! Where is that detangler? 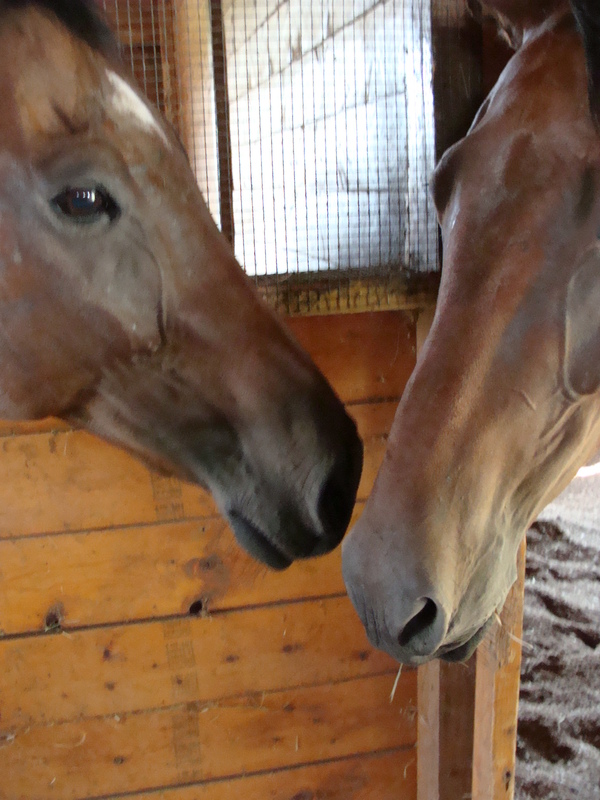 Do you ever wonder what your horses talk about when you are not around? Heck, I worry about what Cigar tells Ike when I’m standing right in front of them. I have tried to tell Ike that it is in his best interest to NOT listen to anything Cigar tells him, but I’m pretty sure that goes in one ear and out the other. Don’t younger siblings always want to be as cool as their older ones? Today was dewormer day. And at least thus far, Ike is more cooperative when it is time to administer dewormer. Getting medication into Cigar is always an argument – much like getting carrots into my younger brother when we were little, “if you make me eat them, I will spit them out.” I have developed a relatively successful method after many failed attempts. I hook my right hand over Cigar’s nose while hiding what is in my left hand. There is usually some backing up, the raising of the head and nose, and a feeble attempt to bite me. The left hand then swiftly inserts the tube into the side of Cigar’s mouth and I plunge in the paste. Typically I end up wearing a good third of the contents of the tube or see it fly into the shavings. At least the dewormer paste is inexpensive. I watched about $25 worth of Ulcergard hit the stall wall years ago. I then received the evil eye. I tried to make peace with a treat, but Cigar spit it out at my feet. Awesome. He then tried to bite Ike. I’m feeling the love. I waited to administer Ike’s dose until after we rode. Call it self preservation. [Our ride was decent. I attempted some leg yields, but could not tell you whether or not they were acceptable for this point in our training. I don’t have the “feel” for the correct angle and motion for the lateral movements on a green horse. What can I say? I’m a novice. I’d rather admit my ignorance that flit along thinking I know it all.] It was then Ike’s turn for his dose. Phew, Ike chose to ignore Cigar’s advice. He quietly stood and let me squirt the paste into his mouth. Not a drop in the shavings or in my hair. 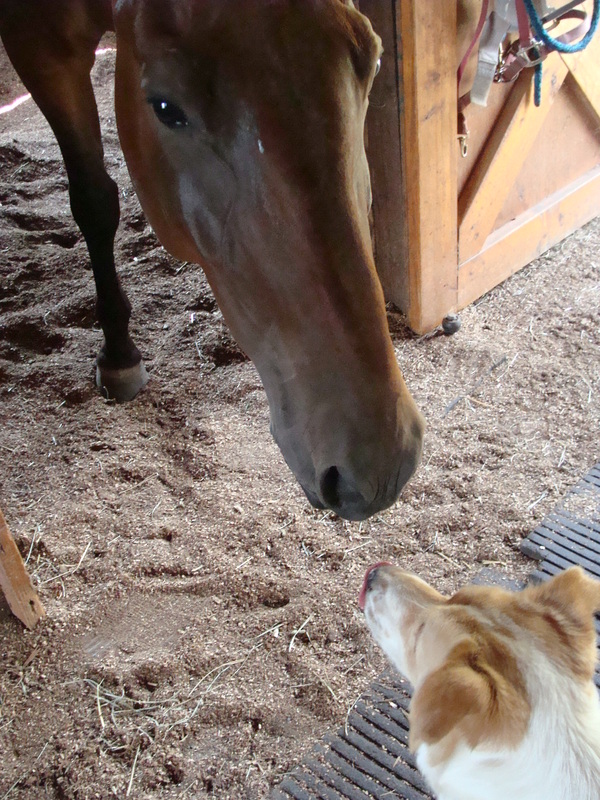 Score 1 for horsey mom and 0 for big brother. I’d better enjoy the lead while I have it. The weekend is winding down. Virginia has finally received some much-needed rain and the grass in the paddocks is attempting to make a late summer comeback. The horses are very busy trying to eat the green shoots as soon as they emerge; we give them hay, but you can tell that they believe that fresh grass is so much better. Can you blame them? 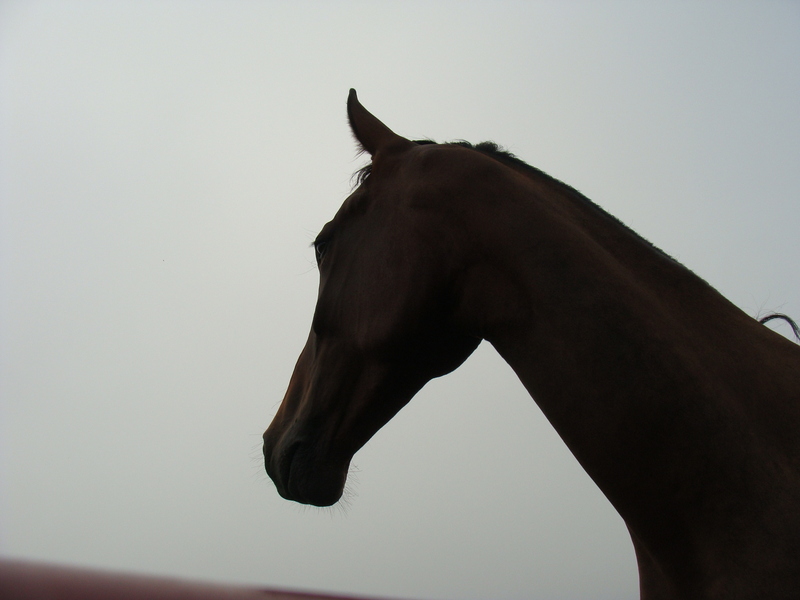 When I arrived at the barn on Saturday, there was a smattering of raindrops on my windshield. It was my hope that I would get my ride in before the rain began in earnest. Ha! What is it they say about the best laid plans? Wouldn’t you know that as soon as I swung my leg over Ike that the rain became more steady. Well I was already in the saddle, so we continued on for as long as I could see through my glasses. The high point of the rain was that it kept the wicked horse flies away – there was much rejoicing on my part as well as Ike’s. The rain also seemed to encourage Ike to keep his head down and steady. We quickly worked through walk, trot, and canter. Played a bit with leg yield. Ike has a loooong back, so I find that my whip is a necessary tool while teaching the lateral movements. My leg is a decent length, but sometimes not long enough to speak effectively to the hind end. I’m finding that I have to use my whip judiciously or Ike’s response is a tad more than I expect or want. After 30 minutes we threw in the towel. No need to rinse the sweat off Ike, the rain already took care of that chore. No rain while I rode this morning, but Ike and I were wet none-the-less due to the nearly 100% humidity. I was the first one to use the arena after the rain, so it was a great opportunity to work on straight lines, circles and square turns. We worked at the walk and trot since the footing was slick – why take a chance when there really isn’t a pressing reason to do so? We are straighter than we used to be but you can still see where we fall to the right just before we turn left…#&$#%, hmm, the rider still needs to gain control of that outside shoulder…I bet a half halt would help that. I bet if I did half halt, it would be a bit too late and we’d still manage to fall right. Grr…one of these days I will master the half halt and escape half halt hell or hopefully at least end up in purgatory. So, I declared to Ms. C today that my goal for 2013 is to qualify for and compete at the USDF Region 1 Great American Insurance Group Championships at Training Level. The GAIGs are about as lofty a goal that I will set. National acclaim or the Olympics are just not in the cards. Countries study the war tactics of their enemy. In business, you must know your competition in order to establish what your market share will be. 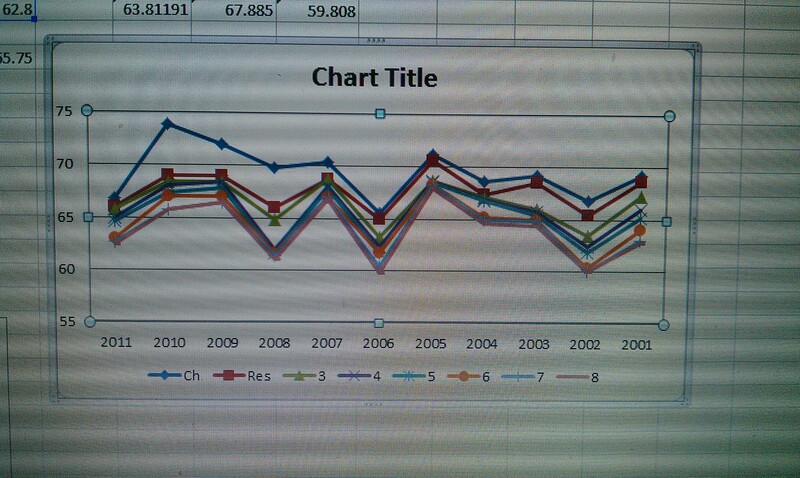 So the science geek in me decided to analyze the Region 1 GAIG results at Training Level for the past 11 years. [For full disclosure, I have a background in biochemistry, analytical chemistry and environmental science and engineering…yeah, science geek about sums it up.] This analysis will have no bearing on our performance, but at least I know what I’m up against as I head down this road to Lexington, VA in October 2013. If you Google the term half halt, you will get 98,700,000 results. Is that all? One of the basic riding skills we should all master, but that is easier said than done for people like me. Let me explain – I’m not the most coordinated person. I did not participate in sports that required balls, unless it was necessary to pass gym class, since I lacked even rudimentary eye/hand coordination. My mother enrolled me in ballet class hoping that it would help instill some degree of grace in my movement, but ended up calling me Grace because I had none. The half halt requires a certain degree of coordination in order for it to be given effectively. Squeeze legs, engage core, squeeze fingers with the correct amount of pressure, release, repeat as necessary. Yeah, sure, just that easy. Well as I predicted yesterday, I failed with my half halt timing today in my lesson. We were working on square turns at the trot. I rode three corners when I hear Ms. C ask, “How was your timing on that turn?” Hmm, I could have tried fudging it and saying that I thought it was spot on, but I knew better. “It was late.” So I try again, this time with Ms. C’s direction. It is always so easy when you have someone telling you when to do it. 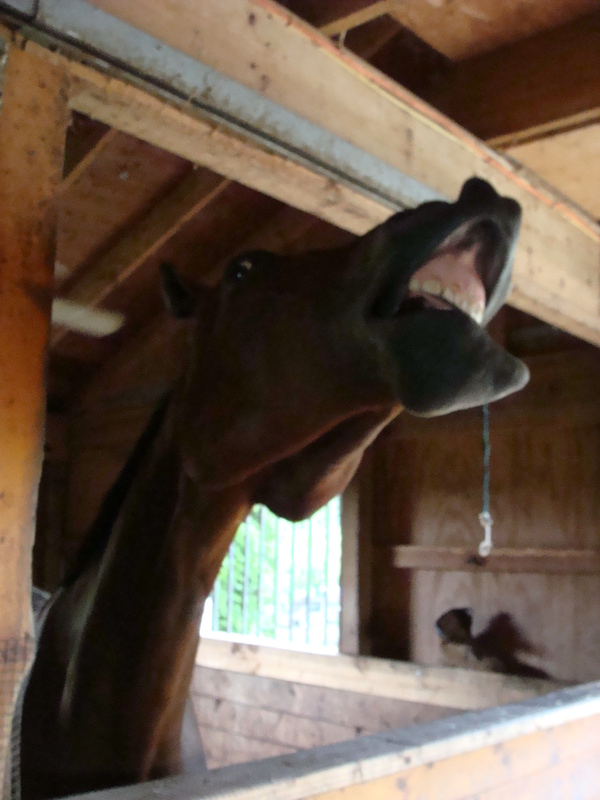 Then the only thing you have to figure out is how loud that half halt needs to be for your horse to respond. Ike and I are still working on the half halt scale. Sometimes I have to be VERY LOUD with the half halt to affect any change – typically on Ike’s “lalalala, I can’t hear you” days. Other times when I am that loud, Ike hears walk or halt. Honest mistake. We are a work in progress. Worked on some lateral work after my half halt debacle. Attempted shoulder fore and shoulder in. We wavered between the two as well as being over bent and showing no bend or flexion whatsoever. Ah, training a young horse with a big body. While we are not confirmed in either shoulder in or shoulder fore, I am happy to report that Ike can hold the bend longer than he could 4 months ago. Forward progress! We then spent a short time with leg yield. I have to report that the rider needs to be better coordinated with leg, seat, and hands to help Ike achieve better sideways movement. When I do achieve the proper aid sequence, surprise, Ike’s movement improves. I know, it is a shocking revelation. The nice part of working on controlling Ike’s shoulders for the lateral movements is the improvement in his canter. Wow, his transitions were lovely today. We also could manage round circles…r-o-u-n-d. It is amazing what you can do when you can control that outside shoulder. Improvement will only come when Ike matures and strengthens AND the rider becomes more effective at timing her aids and remembering to half halt/half halt/half halt. It always seems to come back to the effective half halt. I found a post on Facebook that said, “If at first you don’t succeed…try doing what your TRAINER told you to do the first time.” And can you guess what Ms. C tells me to do more than anything else? You guessed it, the half halt. We are getting ready for a circle, slight half halt to get Ike’s attention, another half halt a step before the letter and I attempt to squeeze the fingers on the inside hand just a bit more, now step in the direction of the circle, and “you were too late with your half halt!! !” What? Sigh. So, again, Ike cannot be blamed for not properly bending as we feed off onto that circle. His rider seems to be a day late and a dollar short on a regular basis. Another schooling show is behind us and Ike again continues to try his best. We came home with two 5th place ribbons for our Training 1 and Training 2 tests. This was a unique show because all the riders showing were grouped by their Virginia Dressage Association Chapter affiliation, their scores averaged, and then the chapters were placed. I’m happy to report that my chapter placed second. We have a small but talented group of riders and we all work hard to get the best out of ourselves and our horses. Some might say that Ike and I should have done the Intro tests to pull higher scores to help the chapter, but I was wooed by our Training Levels scores at our last show. I know good and well that we are still not confirmed with our canter transitions and our connection is not always solid. The only way to improve is to go out there and try and try again. Warm up was challenging. Ms. C noted that Ike demonstrated his Hackney genes as he fired up in the warm up arena. To try to achieve some focus and relaxation, Ike walked a circle around Ms. C for a good 20 minutes. I finally whispered for a trot transition. Ike attempted to listen, but again I had to down transition to dial down the energy. We were lucky that a young rider friend was in warm up with her 20+ year old mount who had the “been there done that” attitude. She kindly let Ike walk around the arena with Tyrone as a buddy. We might have to hire them to come to all shows with us. 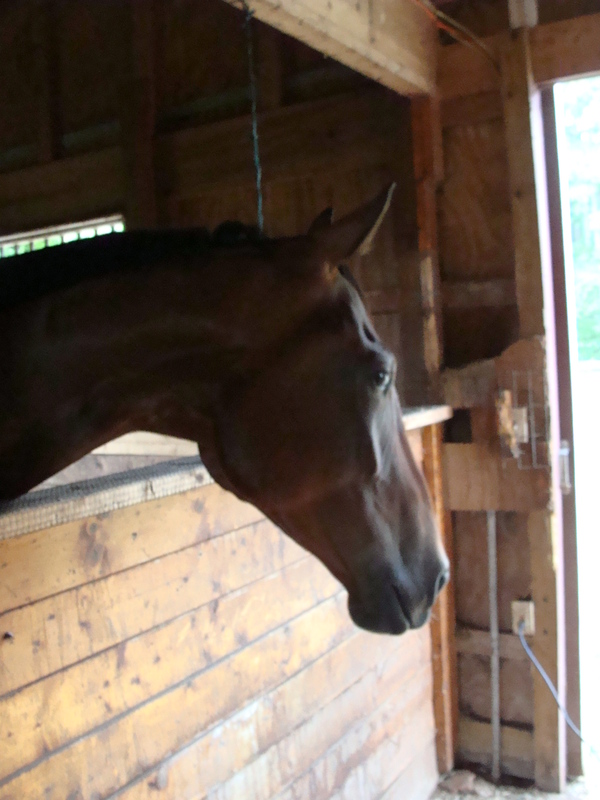 Ike was finally able to focus and warm up could proceed to trot and canter. Our first test was Training 1. This was the test where I wish we could drop our highest and lowest scores and average what remains…everything was spot on until it was time for our right lead canter. Just as we started our circle at A, Ike was distracted by something/someone/a swallowtail butterfly. That distraction caused him to shift his weight to the outside. Try as I might I could not get him refocused or rebalanced. The wrong lead. Drat! Down transition and try again. Cross cantering. %@##. One more down transition. We got the right lead for maybe 3 strides. Too little, too late. We did recover enough to nail our centerline. When we got our test back, there in print was our “2” for the transition and a “3” for the half circle. Sigh, that hurt our bottom line. 61.667%. If we try to focus on the good, Ike was spot on with everything else. Even the judge made a final comment that things will get better once he develops more strength and can better engage the hind legs. Time for our second test. Deep breath. I opted to carry the whip in my left hand in hopes to help with the right lead, but also knowing that it might backfire and cause problems with the other parts of the test. The bell rang, so off we went down centerline with whip in hand. Was this a brilliant test? No. That test was ridden by the winner of the class who got a 77% – I saw part of the ride and they were that good. Did I push to get that “8” trot? No. But we did nail both our canter transitions and the judge rewarded those with 7’s. Final score was a 66.4%. So why aren’t there any photos from yesterday? Welllll, that would be because we forgot the camera. Luckily, Pics of You were present and have already posted their photos at http://www.picsofyou.com/store/index.php?do=photocart&viewGallery=18413#page=1. They were kind enough to edit out the right lead canter fiasco. 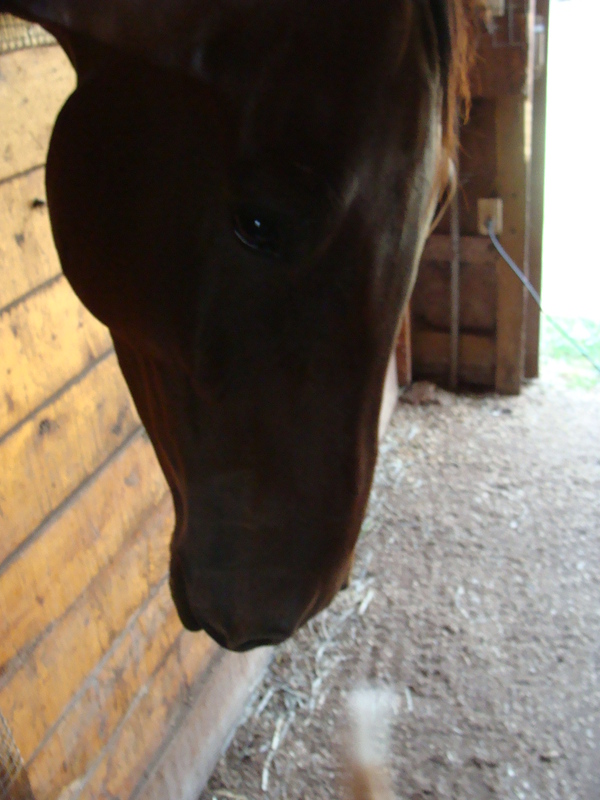 Big man earned his day off today and enjoyed a handful of mints from his appreciative owner. His newest ribbons are proudly hanging with all his others.